Denmark vs France. The French need just a point against Denmark to seal top spot in Group C, whilst a draw would also confirm the Dane’s place in the last of the World Cup. Despite two wins from two games, France are yet to turn up at the World Cup. Two narrow wins – 1-0 last time out against Peru – has ensured their spot in the knockout rounds, but their performances have been far from spectacular. Against Peru, Didier Deschamps opted for Olivier Giroud and Blaise Matuidi. The presence of Giroud, in particular, was noticeable as he offered a platform for Antoine Griezmann and Kylian Mbappe to weave their magic. It was the PSG striker who got the solitary goal, opening his account for the tournament. Like Belgium, France have one of the most talented groups of individuals; probably the most, considering their strength in depth. However, they’re still yet to dominate a match or take it by the scruff of the neck. With the obvious talent on show, you have to feel it is only a matter of time before they blow a team away. France have a lot of young players, in between the age of 19-25. Those players still need to mature and acclimatise to tournament football, before we see the very best of them. Denmark moved onto four points following their 1-1 draw with Australia. They once again conceded a goal, courtesy of VAR. Cristian Eriksen was again a key performer in their impressive first-45 minute showing. The Tottenham man opened the scoring with an expertly timed half-volley. They will be without their explosive attacker Yussuf Poulsen for this game, however, after the RB Leipzig forward picked up his second yellow card of the tournament against Australia. Whilst Denmark may not have the star names of other major nations, they do have a strong spine to their side. Kasper Schmeichel conceded his first goal in 571 minutes of international football against Australia, illustrating their defensive prowess. They need just a point in this game to seal second spot in Group C and will take top-spot with a win. Sandro Ricci is the referee for this match. The Brazilian has averaged 4.77 yellow and 0.42 red cars in 77 international matches. With that in mind, I would recommend a maximum of 40+ match booking points. France’s performances will improve and that might happen in this game. With qualification already secured, the shackles will be off or at least slightly loosened. Denmark, have all the tools to frustrate them and need just a point. As a result, I could see this one ending as a draw. 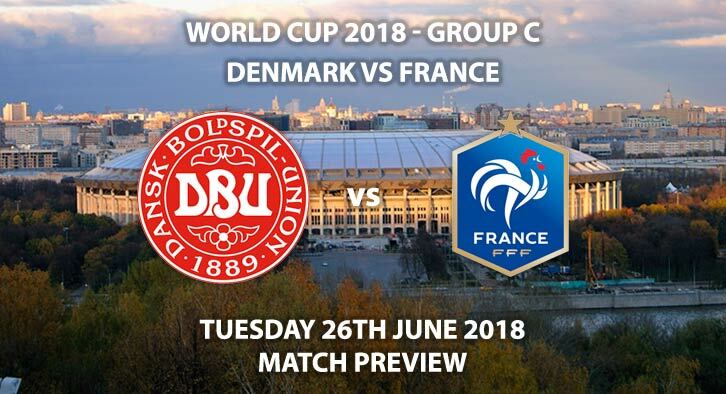 Denmark vs France will be televised live in the UK on ITV 1 with kick-off at 15:00 GMT. Draw – 1-1 – (link no longer available). Mbappe to score first – 5/1. Both Players to Score – Griezmann and Eriksen both to score – 11/1. France to win by exactly one goal – 5/2. Tips updated at 13:20 GMT on 25th June 2018. Markets will likely be updated again prior to the game kicking off so keep checking back.